These can be shaped to fit what ever you are using them for; hamburgers, hot dogs, sausages, lobster rolls etc. The trick is NOT to let them rise. We have found that you don't even have to let them rest if you are in a hurry. In a large bowl, dissolve yeast in warm water. Add oil and sugar; let stand for 5 minutes. Add the egg, salt and enough flour to form a soft dough.Turn onto a floured surface; knead until smooth and elastic, about 3-5 minutes. Do not let rise. 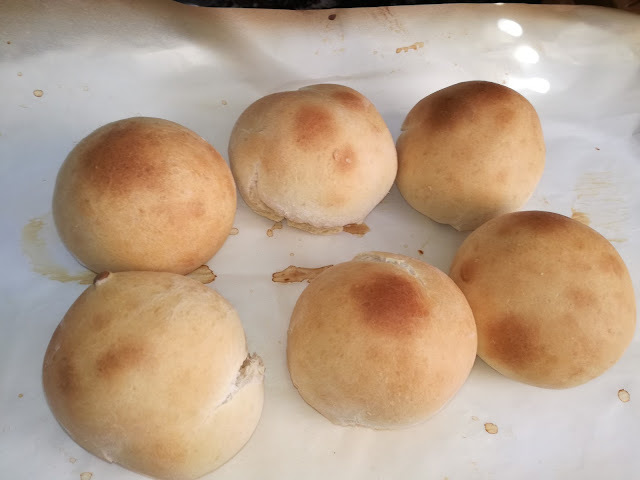 Divide into 12 pieces; shape each into a ball (if making hamburger buns). Place 2 inches/5cm apart on a parchment covered baking sheet .Cover and let rest for 10 minutes. Bake for 8-12 minutes or until golden brown. Let cool 10 minutes. Cut open and toast if you want.